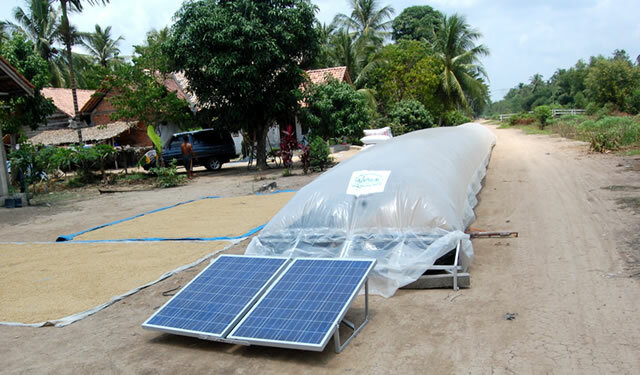 The Solar Bubble Dryer (SBD) is a low-cost, portable, and innovative sun-drying technology developed by the International Rice Research Institute, Hohenheim University, and GrainPro. Proper and timely drying of rice grains ensures good quality produce, which can command a competitive market price. The traditional sun-drying method is beset with problems like uneven drying or overheating, which causes grain breakage during milling, spillage, and contamination (e.g. animals, vehicles etc.). Additionally, with climate change, the weather has become unpredictable, thus, making grain drying more difficult for farmers. With SBD, the drying process is faster, more regulated, and cost-efficient as it does not require fuel or the power grid to operate. The SBD comes with a photovoltaic system that consists of solar panels, which generates the electricity needed for the drying process. Additionally, the enclosed feature of the system protects the grains from spillage and foreign contaminants. The SBD is environment-friendly and helps in mitigation efforts since it harnesses the sun's natural energy and does not require fuel or carbon-emitting power sources.